‘Tis grilling season. And Saber Grills will be sending one of their high-end grills someone’s way, along with $100 to help kick-off their next cook-out. 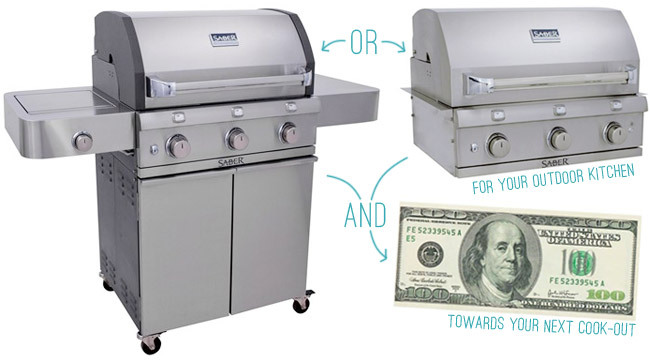 The winner can choose between two stainless steel grills: a full-size Saber model ($999) or its built-in cousin ($1,199). They’re created by outdoor cooking experts (hence their collection of recipes), so they’re designed to get the most flavor out of your food with things like infrared heating for quick and efficient cooking. Plus they boast cool features like commercial grade stainless steel and halogen lights on the hood for nighttime grilling. Neighbors are about to be jealous. Please use the Rafflecopter widget below to enter (it might take a second to load, but it should eventually pop up below this paragraph). This giveaway is available to residents of the United States and Canada. This would be amazing!!! I’d totally go for the built in one for my future outdoor kitchen! Is this contest open to your awesome Canadian readers? That’s funny, when the page first loads I can see where you have written that its open to the US and Canada, but within a half second the rafflecopter box opens and blocks that info. Sorry about that! It’s being glitchy, but we think we have it solved. Oh my goodness, I hope we win this. We could use a new grill so bad. We inherited ours from my grandma, and it’s on it’s last leg. Wow, an amazing give away this week. fingers crossed! Is this giveaway available for us Canadians? Weird. Never mind. I briefly saw your disclaimer when I sent my comment, but then it disappeared behind the Rafflecopter widget. I love how easy your giveaways are! I don’t have to do or like a million jillion things to enter. Thank you for this!!! What a perfect (and much needed) summertime giveaway! Oh man, this would be amazing to win!! Good luck everyone! We just bought a house and we had to make so many unexpected repairs. We had no idea how much there was to do. I would LOVE to win this grill for my husband and I! Quick question – do you email the winners of your contests? I have been entering for years now and part of me wonders if maybe I am winning EVERY TIME and just never knew, lol. Haha! We do email our winners and their name is displayed in the Rafflecopter box after the contest closes too. Entered! My husband would love this!! It doesn’t say “this give-away is available to residents of the US only / anywhere in the world”! And you usually also include a paragraph saying “To enter please fill out the rafflecopter that should take a second to load but will eventually pop up beneath this paragraph”. Are Canadians eligible to enter? Is the giveaway available for Canadians too? Thank you for making a simple one-click Rafflecopter entry. I really hate the new trend of having to Like/Follow on 10 different social media sites, leave blog comments, tweet, etc. I totally agree, Estelle – thanks for making it simple, guys! This is such an amazing giveaway! So sad it’s only available to the residents of the us and canada only. This would be fantastic! Between buying a new home, that needs some love, and all the projects. Well, buying a grill has been put on the back burner, pun intended. This would be a very welcome addition to our home. OHHHHH this would be amazing. Man. My parents have been using the same grill since I was born and have been having a rough time with it. This would be such a nice thing to be able to give them. Arrival of our first baby in August, this grill will make for quick, easy meals! Oh, wow, my husband would love this! He’s been eying the grills at Home Depot every time we go. This would be awesome!! You guys always have such amazing giveaways!! Summer isn’t summer without a grill! This would be perfect timing; we just trashed our last one. My husband would so love this! Eeeekkk…Keeping my fingers crossed…we are building our home and this would be amazing in our outdoor kitchen! Oooh! This give away is amazing! THIS would be awesome! Perfect timing as our old yard sale purchased grill is about dead and this would look so much nicer on our soon-to-be built deck next month! What a fascinating grill. I had no idea that they could cook with IR heat on a grill. Also love the easy natural gas conversion. I don’t normally click through but this one was worth the visit. We will be in the market for a grill soon and we will be back to take another look at the website before we purchase. I never thought I’d think a grill is pretty but this one is. My husband is the master of the grill at our house and his grill has seen better days. I would so love to surprise him for his birthday (Aug 1st) with a new grill… he so deserves it! And it would give him a reason to invite the guys over and have a guys night out(side) he can show off his fathers day gift of a fire pit he built and birthday gift grill. I would love to have a grill. We have an old charcoal grill now but a real one would be fantastic. I’m terrified of gas (Hannah Storm, so I’ll pass on this one.